Kallista loves baking cakes and she really wanted this Cake Shed puzzle! 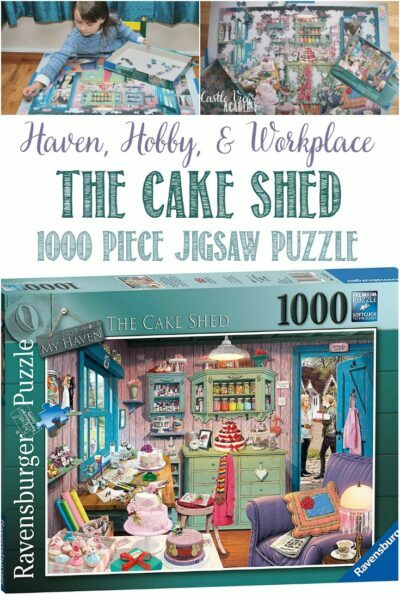 Her cakes are legendary, and as she’ll be baking two this month for birthdays in the house, I could hardly say no to her request for the Cake Shed puzzle! 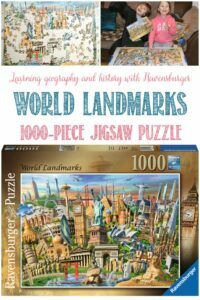 And as with most of our Ravensburger puzzles, the timing was good for this as the first autumn cold was running through the house and I wasn’t moving much so it was just my speed! 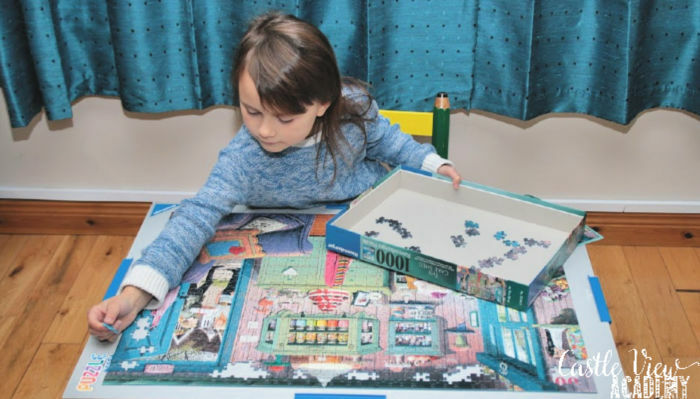 Ravensburger kindly sent us a copy of The Cake Shed to put together; Kallista began to sort out the edge pieces of The Cake Shed on her own and piecing them together. 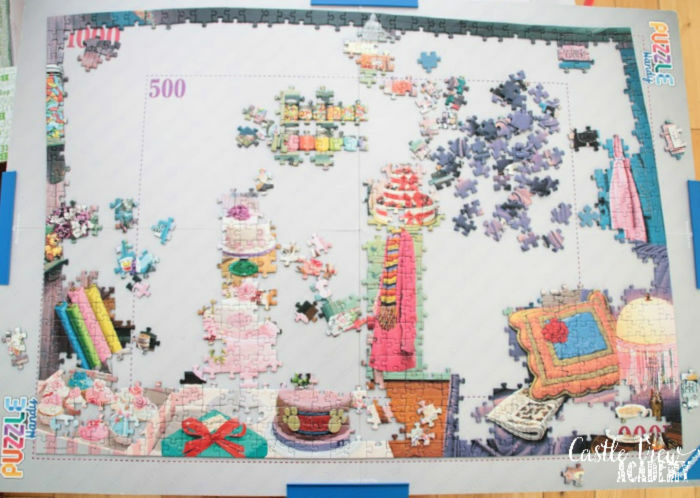 Later I helped sort out the middle pieces into piles themed by colour while Kallista put the polka-dotted apron together. 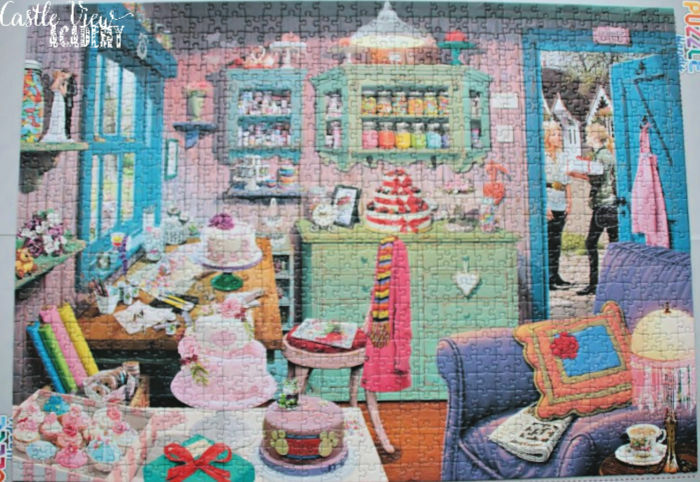 The bright colours of the scarf and jacket stood out so I put that together as I came across the pieces while Kallista worked on the candy shelf at the top of the puzzle. The cushion on the armchair had quite distinct colours, so they were easy to spot and assemble. That cushion seemed huge! The gift wrap was easy with its bold, solid colours, and once that was done, the cakes and purple chair started to take shape. Next it was onto the cupboards and the window frames with the adorable little kitten peeking through, watching for a chance to get in and find some mischief! Even Tristan sat down to help out now and again…particularly towards the end. 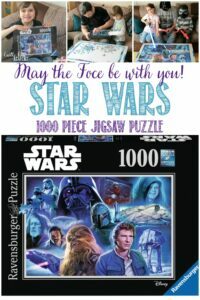 He thinks puzzles are too difficult for him; he sees 1,000 pieces and can’t comprehend it, but if you give him a specific piece to find a home for, he is perfectly capable of doing that without much trouble at all! He’s getting better, and I’m sure in another year or two he’ll be putting the rest of us to shame. The Cake Shed is great for any time of the year; but perhaps particularly autumn, as you can see it’s the current season by looking through the door and seeing the leafless trees. However, it is warm, dry, and cheerful inside the Cake Shed! 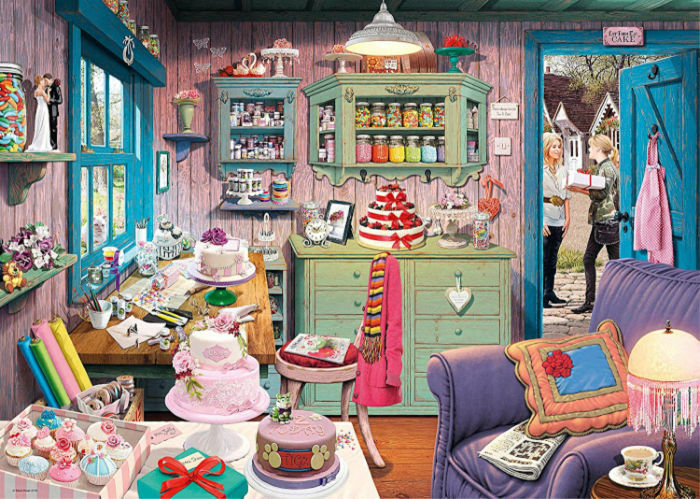 The owner of the Cake Shed can be seen handing over her latest commission to a happy customer. 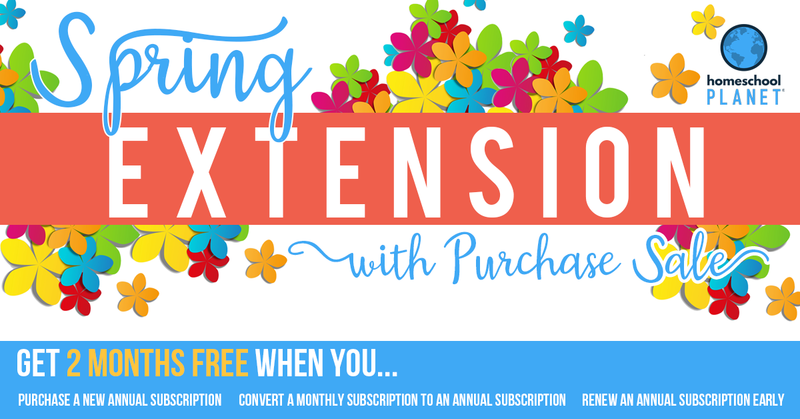 Now she will have some time to curl up in the chair with a cup of waiting tea to relax. 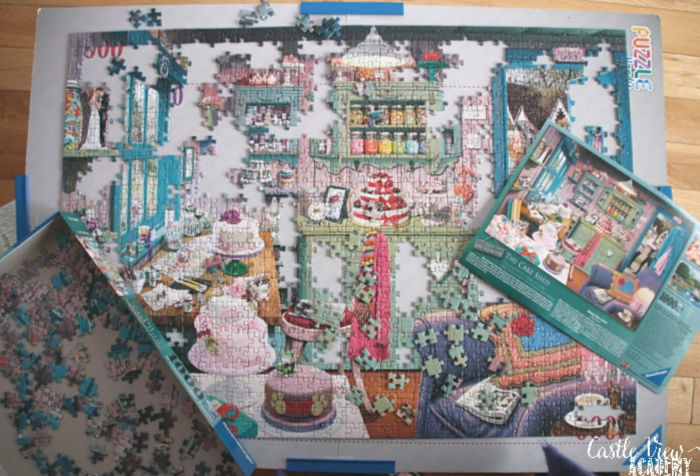 I love the pastel colours of this puzzle, along with the turquoise window and door frames. 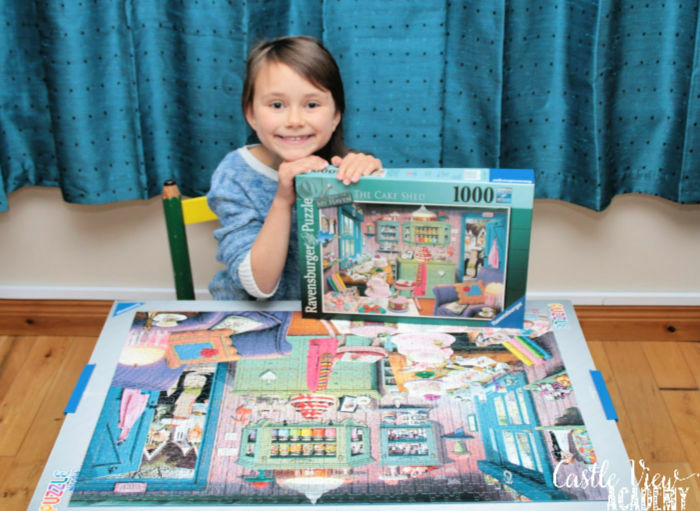 This puzzle went together surprisingly smoothly and was completed within just two days! 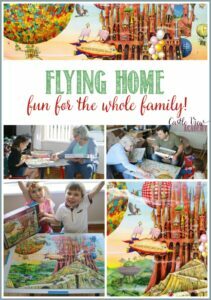 Instead of feeling like a recluse away in the bedroom writing and working, I was enjoying the company of my family in the front room. I do believe the Cake Shed has been giving Kallista more ideas for her cakes, both for this month, and for her future business. 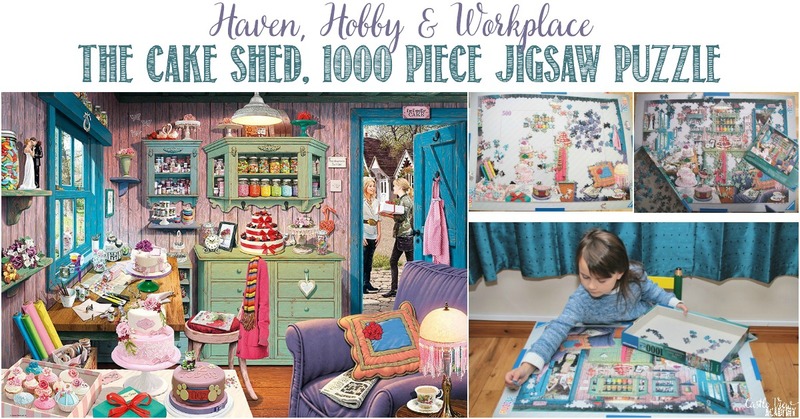 The Cake Shed 1000pc Jigsaw Puzzle is available through fine retail stores and Amazon.co.uk. 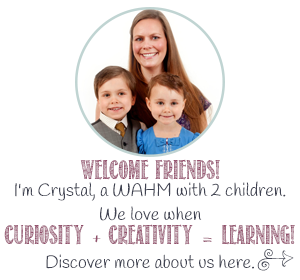 « Give Your Children a Roarin’ Bright Smile – Deeno’s On Kickstarter!